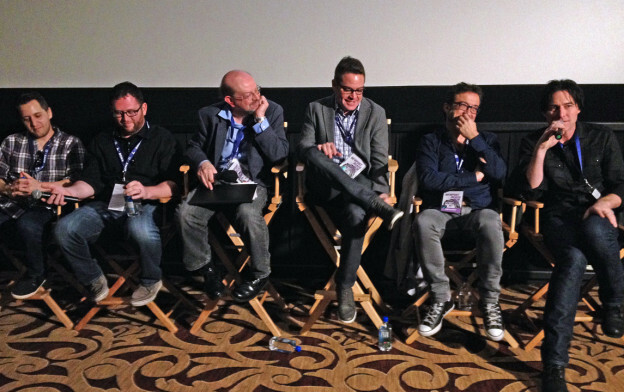 It was a fun day at the Newport Beach Film Festival, where I moderated a 90-minute panel of film and television composers discussing “The Art of Music in Visual Media.” From left to right, they included Jason Miller (The Odd Couple), Matthew Margeson (Kingsman: The Secret Service), JB, Ryan Shore (The Millionaires’ Unit), Roque Banos (the upcoming In the Heart of the Sea) and Tyler Bates (Guardians of the Galaxy). We covered everything from the current climate for composers in media to nuts-and-bolts issues like budgets and compressed time schedules. Thanks to Ray Costa for putting this together and inviting me. This entry was posted in and tagged film and TV music, Jason Miller, Matthew Margeson, Newport Beach Film Festival, Ray Costa, Roque Banos, Ryan Shore, Tyler Bates on April 25, 2015 by Jon Burlingame.